Sheikh Rahman began his speech with an invocation. He said that if he had done that in Pakistan he would be charged and would be in prison. "Thanks Robin Marsh and Margaret Ali for allowing make the presentation to this august gathering in the Houses of Parliament." He said, "I have campaigned with my friends and colleagues within the community to seek redress against the draconian laws and the injustice that exists even within the constitution of Pakistan and that are in complete opposition not only to the Universal Declaration of Human Rights, to which Pakistan is a signatory, but also in contradiction to the (Pakistan’s) constitution itself. It is a difficult subject. Justices Muni and Kayani repeated this vision in 1953 in the wake of the first agitations against the Ahmadi community. They issued a landmark warning against bringing religious matters into the realm of state and law. The consequences of failing to heed this advice over the years is now apparent. Anti-minority sentiment is widespread, deep-seated and state sanctioned. By enabling extremists to persecute religious minorities Pakistan strengthens the support for terrorism. The first victims are Pakistanis themselves, unfortunately. Five decades after eliminating almost its entire Hindu and Sikh communities, the Islamic state of Pakistan is now turning on its own Muslims: Shia, Ahmadis, and other supposedly non-compliant Muslim sects. Non Muslims in Pakistan have always faced discrimination. In the land of Islamic purity Ahmadis suffer from a variety of restrictions of religious freedom and widespread social discrimination. Including violations of their places of worship, denial of the right of burial in Muslim burial grounds, denial of freedom of speech and assembly and restrictions on their press. Several Ahmadi Mosques remained closed. Anti-Ahmadi laws have led to systematic, state sanctioned persecution of the Ahmadi Muslim community. I would like to empathasise the words ‘state sanctioned’. By law Ahmadis are not allowed to call themselves Muslim, call their places of worship Mosques, or call their worshippers to prayer in the traditional adan, greet people with the traditional Asalaam alekum. If an Ahmadi Muslim engages in any of these basic Islamic tenets then the Government of Pakistan’s penal code allows it to punish them with up to three years in prison or even death. Second Ammendment to the 1973 Constitution, again I state that this law, passed in 1973, is in opposition to the constitution itself. Passed in 1974 this amendment defined Muslims in the Pakistani context and declared that Ahmadi Muslims were non-Muslims for the purposes of the constitution. Later Ordinance 20 in 1984. Congress passed 5 ordinances targeting religious minorities. A law punishing the defiling of the Quran, a prohibition against insulting the wives, family or companions of the Holy Prophet of Islam, and two laws specifically restrict the activities of the Ahmadis. These laws criminalise Islamic behaviour of Ahmadis the including the basic worship. Section 295A These are included in the Pakistan penal code so they are criminal laws. 295A of the blasphemy laws prohibits injuring or defiling places of worship, and acts which seek to outrage religious feelings of any class of citizens. 295B makes wilful desecration of the Quran or a use of its extract in a derogatory manner punishable with life imprisonment. 295C states that whoever by words spoken or written or by visible representation or by imputation, innuendo, or insinuation, directly or indirectly, defiles the sacred name of the Holy Prophet, Mohammed (pbuh) shall be punishable with death or imprisonment for life and shall be liable for a fine. This is state persecution. Criminal law act of 1986, known widely as the ‘Blasphemy Law’ have also against which most of sensible Pakistanis have campaigned against. Most of the human rights organisations have campaigned against. Similarly the Western Governments and the United States have campaigned against. This law still exists. Attempts to amend the law have most resulted in two deaths. One was the Governor of the province of Punjab. He campaigned for the decision not to be imposed on a Christian girl. The Federal Minister for Minorities was shot dead after he campaigned for the removal of the Blasphemy law. 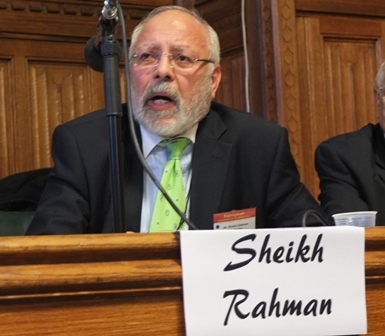 Shareed Rahman, who has now been appointed as the Ambassador for Pakistan to the United States, put in a draft provision to amend the Blasphemy Laws but he was told to shun off and was removed from Government as a result. Government involvement in persecution just does not end with the enactment of laws. It is just the beginning. Ahmadi Muslims are the only religious community that does not have any form of representation in Government. The anti-Ahmadi laws give the federal, provincial and local Pakistan Government the right to harass, torture, imprison and prosecute Ahmadis at will. The authorities protect hate mongerers. You can make a speech against any of the religious minorities in Pakistan. The Mullahs come out onto the streets to incite the people which is something you cannot do under the law, and the Government takes no action against them. Voting rights: The Ahmadi Muslims are the only people in Pakistan who have to denounce their religion in order to vote which is a basic human right. In early 2002 the Government of Pakistan abolished hitherto separate electorates for Muslims and non-Muslims to create a unified electorate under the executive order of a military dictator. Months later, under pressure from the extremists, this order was withdrawn, thus excluding Ahmadis from participating in the election process. Pakistan law prohibits speeches that incites others to violence yet the Government allows the Ahmadi hate-mongers to regularly conduct assemblies and mainstream media to publicly announce that Ahmadis should be murdered. In order to receive a passport there is an application form that includes a declaration for Ahmadis to sign which states that they consider the founder of the Ahmadi faith to be an imposter prophet and consider his followers to be non-Muslims. The result of this draconian legislation is that hundreds of Ahmadis are in prison awaiting trial or sentencing under blasphemy charges. Since the promulgation of Ordinance 20, 978 faith related criminal cases have been registered. Sadly due to the recent violence against the Ahmadi community 80 worshippers were left dead in two Mosques in Lahore. We have lost more than 250 Ahmadi Muslims since 1974. The press and media continue to portray Ahmadis in a negative way. In the past year alone 1468 negative articles have been published. Our peace loving community is arguably the most persecuted in the world and is enduring the worst persecution in Pakistan in decades. Amnesty international, Human Rights Watch, the Human Rights Commission of Pakistan, the British Parliament, the US House of Representatives, have all called on the Government of Pakistan to end religious discrimination against its own citizens. Unfortunately nothing has been done due to these resolutions and pressure. If the Western Governments want to follow through they need to link their aid to the repealing of these draconian laws. In conclusion, I am an Ahmadi Muslim. You can kill me and call it Jihad. Imprison me and call it security measures. Exile my people and masses call it progress. Rob my rights, invade my land, declare me a minority and call it development. I am an Ahmadi Muslim and will remain so forever."